White People Like taking credit from Asians: Who is Myles Valentin? | Restructure! White People Like taking credit from Asians: Who is Myles Valentin? September 6, 2008 — Restructure! CORRECTION: Valentin’s monetary gain from the Stuff White People Like brand is greater than 0%. According to the LA Times’ interview with Lander, Valentin receives all the ad revenue from blog. According to Valentin, he uses this money for horse-racing. Lander gives Valentin credit as the co-blogger of Stuff White People Like, but the mainstream media portrays Valentin as (just) Christian Lander’s Filipino friend and inspiration. “#11 Asian girls” is the all-time most popular post of web-phenomenon Stuff White People Like, but it was written by Filipino-Canadian Myles Valentin, not White-Canadian Christian Lander. While Christian Lander received a $350,000 advance and receives royalties for his book, Stuff White People Like: the Definitive Guide to the Unique Taste of Millions, Myles Valentin is living paycheck to paycheck in East Vancouver. Myles Valentin has written #11 Asian girls, #15 Yoga, #30 Wrigley Field, #31 Snowboarding, #44 Public Radio, #45 Asian Fusion Food, #56 Lawyers, #57 Juno, #66 Divorce, and #74 Oscar Parties. However, Valentin is rarely mentioned in articles about the blog Stuff White People Like, except being credited as Christian Lander’s Filipino friend. Even Racialicious, an anti-racist blog about race written from the perspectives of people of colour, credits Christian Lander as the “The Man behind Stuff White People Like” and makes no mention of Myles Valentin. While it is true that Lander wrote 90.7% of the full list and Valentin wrote only 9.3% (89.1% and 10.9% respectively before the official book deal announcement), it nevertheless seems unfair that Valentin received no book deal, is rarely mentioned, has never been interviewed, and is not the co-author of the book that spawned from the blog. A white man receives 100% credit for roughly 90% of a blog, and his friend, an Asian man, receives 0% credit for roughly 10% of the blog. This may appear only slightly unfair to some, but what if it was a white man that received 100% credit for roughly 90% of a blog, and his friend, another white man, that received 0% credit for roughly 10% of the blog? Ceteris paribus, we expect that everyone should get their fair share, even if the inequality is not tremendous. If Valentin was a white man, we would expect him to sue for his share of the profit, and we would not disagree with the lawsuit as a means to uphold “meritocracy” and protect white man’s intellectual property. Asians are stereotyped as uncreative, lacking a sense of humour, and as people who are unable to criticize social conventions. When an Asian writes successful satire of white culture, why is his contribution forgotten? Yes. This is like good investigative reporting. And no, what you’re pointing out here doesn’t “appear only slightly unfair” to me. Lander’s abuse of Valentin is another example of white supremacy, specifically, a blithe, egregious white habit. This habit is another bit of “stuff white people like” that Lander would never add to his quirky, smirking, funny, adorable list (don’t quote me on that, though–maybe it IS on his list); he could call it “taking credit for the work and achievements of people of color.” Why the hell isn’t Myles Valentin with Lander on his book tour? Thanks for the information on this, which I was only vaguely aware of. Racialicious REALLY needs to re-post, or at least link to, your work here. Lander’s blog is nothing more than a tool to ironically (re)enforce the traits and characteristics of normative whiteness. It does seem like Christian intentionally doesn’t name his “Filipino friend.” I guessed it was because said friend didn’t want to be named. I haven’t seen any evidence to suggest that Christian didn’t share 10% (or more, or less) of the book deal cash with Valentin. Did any one ask him why he doesn’t identify Valentin? Or ask Valentin? It’s important to get their perspectives than to angrily speculate. If I helped a friend out with something like this, I’d ask that they not mention my name (especially if I was non-white, and I didn’t feel like explaining myself to my entire culture) and, even if I did take credit, I wouldn’t go on the book tour. I have a real job, I’m not a humorous public speaker, and it’s more effective marketing to present a single person as the face of a book. I’d pick the guy who did 90% of the work, is an engaging speaker, and, importantly, is white. Thanks for linking to my post. I also changed “This may appear only slightly unfair,” to “This may appear only slightly unfair to some,” so that it isn’t interpreted as my real opinion. I find it puzzling that you perceived me or my post as “angry”, when there is no indication of anger except for your association between noticing racism and reacting angrily. I don’t think Lander is doing this intentionally. I think both Lander and Valentin are simply puzzled at the media’s reaction. Lander has named Valentin’s name, but the media just doesn’t care about Valentin. How do you know if Lander is an engaging speaker and Valentin is not, since both of them are bloggers? Why would you pick the “white guy”? Also, I’m browsing with Firefox with Adblock and I don’t see advertisements, so I want someone to tell me what kind of ads are on SWPL. @ me & ortho: I don’t want to completely dismiss Lander’s blog and book on white people. I think they’re messed up in a lot of ways, and in a lot of their effects, and that they ultimately do little to challenge normative whiteness. But I think some anti-racism can be extracted from them. The next step for white readers of the blog or book MIGHT then be to think about that group-bound identity and consciousness, and then even work to counteract it, especially its unfairly empowering and oppressive effects. Trouble is, I suspect, very few readers of the blog and book ever even think to take these further steps. Macon, is anti-racism the goal of “Stuff White People Like”? Haha, that’s awesome, jwbe. I guess that’s why I hold SWPD to a higher standard. – Lander definitely names Valentin He points out that Myles is the author of #11 Asian girls and that it’s the most popular post. – Lander was a public speaking instructor, so you’re probably right, karen, that he’s a better public speaker. I still don’t understand the rationale about choosing the white person over the non-white person, though. jwbe, no, anti-racism doesn’t seem to be the goal of SWPL, nor of its author(s). I haven’t read interviews, though, nor seen the Google Author presentation, so I don’t know what Lander’s goals are. Maybe it was just to get rich. What do you think? Restructure, why do you find jwbe’s question funny and awesome? You seem to have read it as a rhetorical question–what did you assume was its point? Also, it would be helpful to know: what criteria constitute your lower standard for evaluating SWPL? Lander wrote it for his circle of friends, because he thought it was funny. In the talk, and elsewhere, Lander has said that if you want to try to become internet famous, don’t, because people will see through it. I thought jwbe’s question was funny and awesome, because to me, it looks like you are being overly critical of SWPL without applying the same degree of criticism to SWPD. However, Lander’s blog isn’t an anti-racist blog, while yours is supposed to be, which is why you deserve harsher criticism. Thanks for the explanation, Restructure. So. . . you don’t have any criteria for judging SWPL? It’s odd to for me that you would say someone’s being overly critical of something that, in the process of addressing race, mostly reinforces insular oblivion (i.e., white racism). It’s been my impression that you care more than that about such things. While it is of course obvious that SWPL isn’t an anti-racist blog, I don’t think that means SWPL’s handling of its topic, white people, shouldn’t be critiqued and/or criticized. Do you? I don’t think anything is “beyond criticism”, and I don’t think that your criticism suddenly become invalid just because it’s coming from you. However, a there is an ironic-situation aspect that is separate from the criticism itself, which is humorous, at least to me. STPL is typical American I guess and it probably only will be a success in America or with people who like this kind of fun or this stuff being supposed to be funny. It’s like American soap operas, people don’t have to think too much. It applies to whatever part of American society but not necessarily to (global) whiteness. It reminds me to a certain degree of Michael Moore’s book “Stupid White Men” which is also American but not necessarily white (in a global context). ‘Stupid White Men’ talks about issues which are quite known outside America but as it seems not very well known within white America. I personally got bored with both – SWPL and Stupid White Men. The success of both tells some or a lot about the readers, not about the value of the content. Which makes me wonder, why would he want to get people thinking about those things? Maybe just because it helps his book and his speaking engagements sell that much better. But then, maybe also because he’s a closet anti-racist after all. AND an anti-classist! Anyway, he does seem to be claiming that there’s serious intent beneath his humor. Which makes me wonder, why would he want to get people thinking about those things? Because he’s a typical educated white liberal, and educated white liberals *are* ideologically against racism and classism by default. 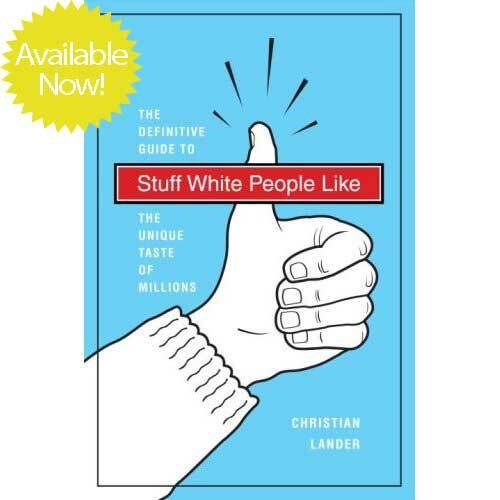 Using Lander’s theory of white people competition, Lander wants to show that he is more progressive and enlightened than “those other white people”, even “those other white liberals”. But then, maybe also because he’s a closet anti-racist after all. AND an anti-classist! Well, typical white liberals and white leftists *are* “closet anti-racists” and “closet anti-classist”, especially the “closet” part, i.e., they are ideologically against racism and classism, but they continue on with their behaviour. Woooow. Wow. White people love cultural appropriation, I guess. as a white man, i’m sure christian feels guilt over his fame versus myle’s. *laugh* i know them both and myles is a different kinda guy…and i’m quite certain not into the spotlight anyway. I definitely think Mr. Valentin should be compensated in some way; but this should be according to his contribution to the blog, which would be around 10% right now. I am confused as to why he should automatically be offered a book deal, however. It is, after all, Mr. Lander’s blog and that is why the publisher is interested. Neither the publisher nor Mr. Lander are obligated to offer Mr. Valentin a position as co-author for a book he didn’t write. I think it is kind of ridiculous to say that he is stealing credit from Mr. Valentin when he obviously credited him with the writing. You act like he is plagiarizing the man! Obviously, now that the book has already been written by Lander, Valentin should not be credited as a co-author. When I said that it is unfair that Valentin is not the co-author of the book , I meant why was the book deal offered to Lander only and not Lander and Valentin? I cant see the adverts on this blog. someone tell me. are they lucrative? « White people are more segregated than minorities.